"Man, what on earth are you doing? Come in to the parlor!" is how my husband Klaus greeted his friend Matthias, patting him encouragingly on the shoulder. It was shortly after midnight. "What a tour, I thought I would not make it!" Matthias took the helmet from his head and peeled off his wet rain gear. "First I set off much too late, then it rained over and over again, it was dark and during the last kilometer the GPS sent me along on dirt roads through the forest. Oh, I'm exhausted." Whilst Klaus put the teawater on the boil, our visitor dropped exhausted onto the chair. - "All will be well, the main thing is, you've arrived." - "Yes, really I’ve been lucky." The next day the sun was shining and everyone was in good spirits. 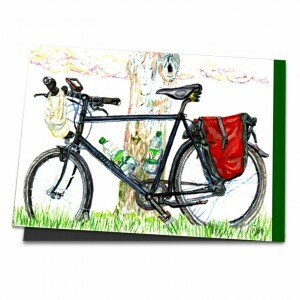 Matthias’s road bike was under the old apple tree - a motive far too nice for me not to paint straight away. "But I have to go by two o'clock at the latest!" Matthias said, looking at the clock, "who knows what awaits me on the way back!" - "it’ll be ok," I replied confidently, "there are still three hours." Then I sat on a blanket in the grass, a glorious Sunday morning. Thick fluffy clouds slid lazily across the sky, no wind was blowing, it was quiet, almost silent, only here and there a bird chirped. I started my image and let my mind wander. A bike is an ingenious invention: a frame, a steering wheel, a saddle, two wheels, lights, pedals - and with just that you can get about. Environmentally friendly, healthy, completely relaxing. Look only at the gearshift: you can save energy and are fast. 15 km per hour with just your own peddling - and it is made even easier with the GPS, if it does not precisely navigate you through the forest in the night. Bright red saddlebags fit a sleeping bag, tent and clothes, sufficient supplies, whatever you need. Even the water bottles on the go mean you can have a break whenever and wherever you want. Picnic, pub, cafe - and when you are tired, you cycle to the next station and can be chauffeured on the train home. Perfect, such a bike: a good vehicle for short trips or long trips, cozy tours or fast rides. Sure, the weather has to play along as well and one has to be prepared for adventure. But the reward is significant: pure independence and nature. Why do I not actually have a really good bike? And where would I go with it? In the mountains, to the coast, around the world? "Ready?" Matthias was suddenly beside me. Already in his cycling clothes, helmet under his arm. "I've already said it; I've got to go!" - "What, only two o'clock" When painting is that beautiful, you forget the time. Well then, a few strokes even for the grass, the trees and the clouds. Done. A few hugs later and Klaus and I were at yard gate: "Bye, Matthias, get home safely!" He waved with one hand, whilst he secured his foot into the pedal. In a flash he had disappeared behind the bend in the road, immersed on his cycling tour again, indulging himself in his own world.